Recently, Michael Pershan (@mpershan) and I had a great conversation on Twitter about lessons and planning. I’ve copied it below. And if you aren’t already following Michael or reading his blog, you’re missing out. FN: In the beginning, my planning took a content focus — WHAT do I want students to know. Now my planning is task focused — the HOW. MP: Interesting. Do you rewrite everything each year? What’s your prep like? FN: While lessons are similar each year, I don’t think I’ve done the exact same lesson twice. Probably not good for my sanity. MP: But what keeps you from reusing old tasks? I mean, you do, so what’s the new planning? Selecting from set of tasks for kids? FN: For example, Hooke’s Law task. Do we: uses scales or probes or hanging weights? Do we use 1, 2, or 3 springs? Do we do multiple measurements per trial? 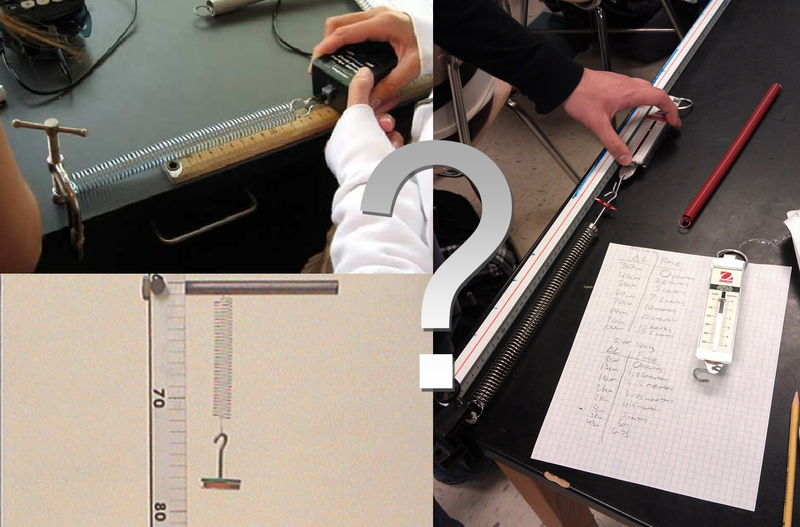 Do I force kids to make stretch the independent variable, or do they choose? Do we graph by hand or on the computer? Do we use LoggerPro or Excel? Do we use ideal springs or ones that have a preload? Does each group use identical springs or does each group get different ones? Students in groups of 2, 3, or 4? Do I give them a worksheet or does it go in their lab notebooks? So many little decisions and permutations. All are important decisions that non-teachers don’t even realize we make. MP: Are these decisions that, you feel, there’s an optimum solution to, or is it different with each batch of kids? FN: Kids, time, what I want to emphasize, equipment … Lots of factors. MP: I really appreciate everything you just tweeted. Thank you. FN: You’re welcome. Not sure that was much help. MP: Sorry to pry, just trying to get a look at what experienced teaching looks like. FN: I’d say experienced teaching looks a lot like jazz. Your statements are spot on! After 30 years of teaching the physical sciences, I still invest a ton of time deciding how Imshould execute an assignment, lab or otherwise, to improve the result we get from students! A myriad of decisions to make on each task… That’s why I appreciate the comments online that you and others are willing to share from your perspectives. Makes teaching so much fun! I used this article just a few weeks ago during my Masters oral defense! Teaching is organic and the planning stage should reflect that. All of your points are good ones and I always walk into a teaching session ready to change everything up as needed. You can always tell when a lesson does and doesn’t click. Definitely reminds me of jazz! Quoted this particular blog post again. I’m amazed at how many times this little quote comes up 🙂 Love it! Thanks!